Hawaii Telescope - Universe Galaxies And Stars Section. Twenty-five years ago, on September 28, 1979, the Canada-France-Hawaii telescope (CFHT) was inaugurated on top of Mauna-Kea, a 4,200-meter high dormant Volcano on the island of Hawai¹i. From the photographic emulsion of the first light to today's 340 Mega-Pixel digital camera, CHFT¹s instruments are cutting edge; its camera is the largest ever built in operation on a telescope. With high-resolution or multi-object spectroscopy, adaptive optics and polarimetry, CFHT has played an important role for a quarter of a century in the development of astronomy, thanks to the support of its member agencies in Canada, France and the State of Hawaii. Once one of the large Telescopes in the world, with a mirror 3.6-m in diameter (a 'small' telescope by today's standards), CFHT continues to serve the astronomical community with stunning images and groundbreaking discoveries, from the small bodies of our solar system to remote galaxies; this has been possible due to a state-of-the-art instrument complement well-suited to the relatively modest size of its mirror and the extraordinary quality of its site. The spectacular image released today is one of the best ground-based images ever made combining wide field and high resolution. 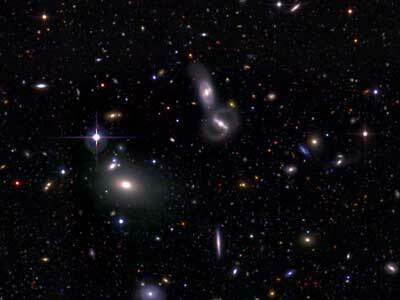 It is the result of tens of hours of telescope time spent on a single 1-degree by 1-degree field for the CFHT Legacy Survey (CFHTLS), one of CFHT's most ambitious scientific endeavors so far. Canada and France are devoting 500 nights of telescope time to the CFHTLS over 5 years to tackle important questions in today's astronomy. While there are still years to go to complete the CFHTLS, this image comes as a spectacular milestone to celebrate 25 years of excellence... and counting!